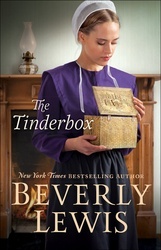 With her Amish parents' twentieth anniversary approaching, eighteen-year-old Sylvia Miller stumbles across a surprise—her father’s old brass tinderbox has been left unlocked. Against her better judgment, Sylvia opens the heirloom, not realizing that what she is about to discover will splinter apart her happy life. Sylvia's bewilderment grows when her father confronts her about snooping in the box. To her amazement, the respected convert to the Old Order reacts as if he has something to hide. Burdened by his deception, Earnest Miller reveals details about his past to his beloved wife, Rhoda. The long-kept secret jeopardizes Earnest and Rhoda's relationship, as well as threatening Sylvia's recent engagement to the preacher's grandson. Beverly Lewis, born in the heart of Pennsylvania Dutch country, has more than 17 million books in print. Her stories have been published in 12 languages and have regularly appeared on numerous bestseller lists.